I received this photo from Kate Lavelle in 2017. 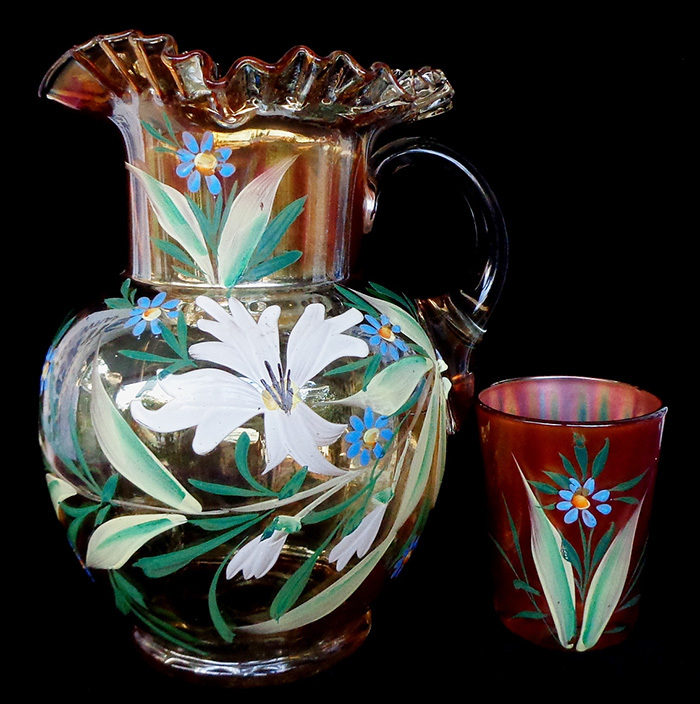 It shows her recently discovered Enameled Aster pitcher along with a tumbler she already had in her collection. Stop the presses! Alert the media! Another carnival glass first comes to you from Midwestern America! Seriously folks, here's a story about a rather obscure pattern that is probably best known to tumbler and enameled pattern collectors. Indeed, as far as tumblers go, it's still very rare to find and, to the best of my knowledge, only five are known in the carnival glass community. 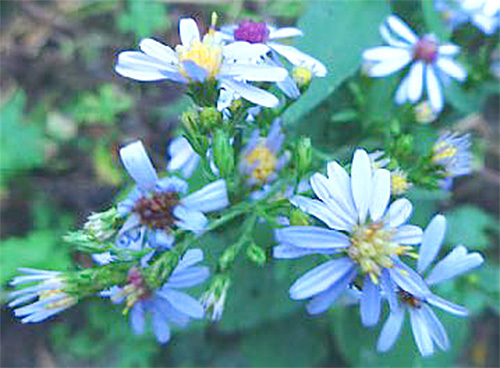 Enameled Asters is a very pretty painted floral pattern that displays beautiful small blue flowers quite similar to blue Fall Asters, accompanied by two-tone green elongated foliage. Long time tumbler collector, Greg Lockhart of Wisconsin, found the first tumbler on eBay several years ago. After consulting tumbler collector Bob Smith and Dean and Diane Fry, it was determined that it was previously unknown and henceforth Greg named it Enameled Aster. As luck would have it, sometime later Greg found four more of these unique and lovely tumblers in a Wisconsin antique mall paired with an Enameled Columbine pitcher. Greg stated in a Lincoln Land newsletter article that he contacted the late well known tumbler collector, Cecil Whitley, who wrote in her excellent small book, The World of Enameled Carnival Glass Tumblers, about this pattern. She told him that she thought that she might have had one at one time, but sadly, it is not in her booklet as she had never seen another one. Mrs. Whitley's booklet is no longer in print, but copies can be obtained through the carnival glass community. A few years ago we were very lucky when Greg offered to sell to my husband Bill one of those four tumblers that he had found in the Wisconsin antique mall. In the Lincoln Land newsletter, Greg stated that he had sold all of his excess tumblers to his fellow Lincoln Land members. It's always been one of my favorite enameled tumblers as my mother loved asters and so do I. As can be seen in the attached photo, they happily grow in my front garden every autumn, delightful in many hues of blue and lavender. On another fun road trip with Lane Booker last September, we traveled north to Wisconsin to visit several small towns and cities that had antique stores. We always find something to buy, be it for ourselves or to resell to other collectors. Being taller, like WAY taller, Lane often gets ahead of me in our hunt and it was he who first spotted the pitcher in a Waukesha, Wisconsin antique mall. When he showed it to me I was shocked, thrilled and beyond pleased. He didn't know the pattern and I'm sure he was surprised by my reaction to it, but I sure did know what it was thanks to Greg Lockhart. It was such a thrill to find something previously unseen or reported. It's in perfect condition and just as lovely as can be. The pitcher is marigold, like the tumblers, in the typical Fenton cannonball shape with a tight crimped top edge and a paneled interior, just like the tumblers have. It stands 9 3/4 inches in height on a 4-inch circular base. The pitcher and tumbler can now be seen on David Doty's excellent website. I can't help thinking that there must be more tumblers or pitchers somewhere out there, only time will tell. I find it very interesting that, with the exception of Mr. Lockhart's first tumbler, all of the known pieces have been found in Wisconsin. We only traveled the southeast quadrant of the state during that trip and found an abundance of carnival glass everywhere we went. It just goes to show you that there is much more to be found in Wisconsin than great people, beautiful scenery, Holstein cows, superb fishing and the best cheese on earth!